Another day off and we decided to do a touristy thing today. We decided to just drive around Hannibal, MO a bit to see what we could find. We were told about a pretty good BBQ place but we were not sure of the directions. We did find a large General Mills facility in town before we found The Sauced Hog. 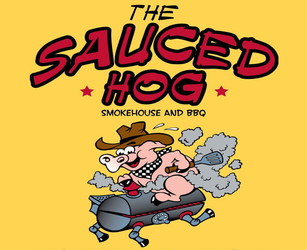 They claim to be the premier place for ribs, brisket and pulled pork. We will be the judge of that later. We were not ready for lunch so this will be a stop for another day. Hannibal is a small town of about 18,000 people. The community is best know as the boyhood home of Samuel Clemens (aka Mark Twain). That explains why many things in the area include the names Mark Twain, Tom Sawyer and Huck Finn. 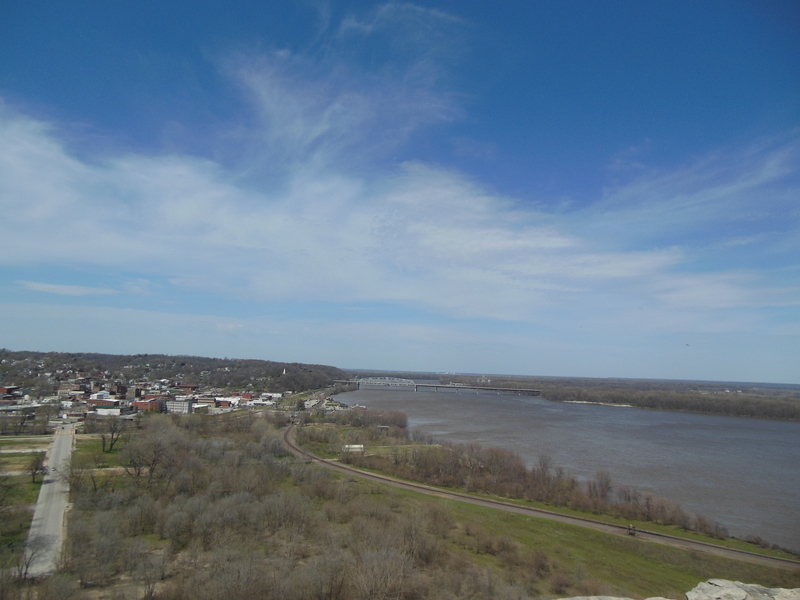 As we continued our drive, I saw a flag on the top of a bluff that overlooks the Mississippi River. We took off up the hill towards the bluff. 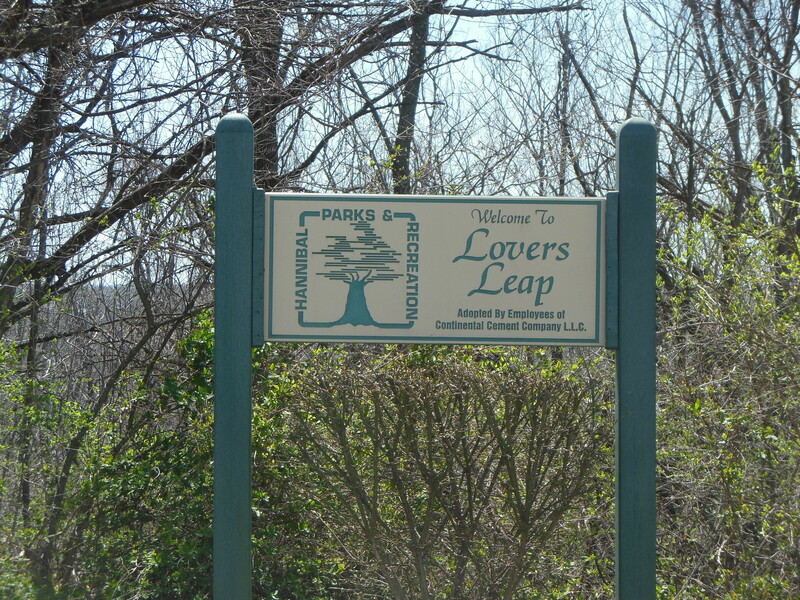 At the top we found Lover’s Leap, a park operated by the city. Tom Sawyer wrote of many such places in Missouri. The view from the top is pretty cool. The Mississippi River may not appear spectacular but it is still the muddy Mississippi with Illinois across the river from Hannibal. While atop the bluff, we had a chance to share our RV lifestyle with two young couples. They both said they dream about doing what we are doing. We gave them our contact info, encouraged them to read our blog and to let us know if they had any questions. Next on our day excursion was a stop at Walmart for a few supplies then a side trip to Palmyra, about 20 miles North of Monroe City. We were in search of a butcher shop and may have found one there. That’s about it for our exciting day. Thanks for stopping by, y’all come back now. This entry was posted in Missouri, Texas and tagged Lovers Leap. Bookmark the permalink. Back in 1980 I worked for a company that opened a division in MO. I was sent there for 3 months to hire and train the staff. I fell in love with the state and even though I am retired and the facility closed I keep in touch with the woman I hired as office manager. I do remember Hannibal, but barely. (so many years ago and old age, don’t you know). Surely I would like a return visit.